Former workhouse, 1777; chapel of about 1860. Site of windmill and hydraulic ram. 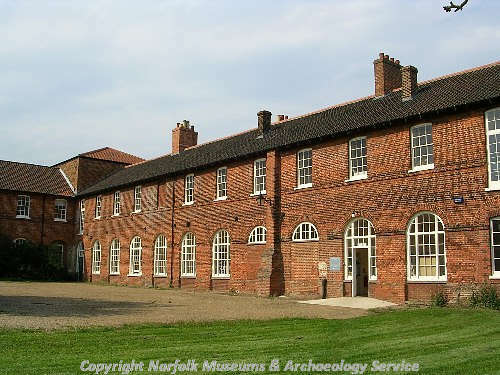 Now the Norfolk Rural Life Museum and offices of Norfolk Landscape Archaeology. See details, photos, aerial photographs list and press cuttings in file. E. Rose (NAU), 10 February 1984. Two flints found, a scraper and a flake, ?prehistoric. A. Rogerson (NLA), 20 October 1992. More skeletal remains, with slabs of tar, possible cholera burial? See report on human skeletal remains in file (S16). Five individuals represented. Some interesting palaeopathology of workhouse inmates. D. Gurney (NLA), 17 July 2000. Recorded an original wall and later woodblock floor. See report (S1) for further details. This work was also noted in (S13). D. Gurney (NLA), 3 November 2000. Monitoring of drainage works. Post-medieval drain, soakaway and inspection chamber seen. See digital images of brick drain (S5). Works also examined by S. Pope (NMS) - see report (S17). A. Hutcheson (NLA), 7 July 2005. The workhouse was built in 1777 on Hoe Common, for £15,000, and was one of the earliest Houses of Industry erected in Norfolk. The main block of the building was H shaped. The main south façade has has a pediment with a clock, and a wooden cupola. A long L shaped wing projects eastwards from the main block. This wing also dates to 1777, but was originally separate from the main block. There was an open, arched arcade, visible on (S2), running along the ground floor of the east wing, which was bricked up in the 19th century. The east wing was originally used for 'cottages', or apartments for married couples. In the 19th century the east wing was used for dormitories and day rooms, and in 1871 became the infirmary. In 1835 alterations to the workhouse were carried out, including the construction of the boundary wall, as well as internal walls that created a series of separate yards. In 1853 Cherry Tree Cottage was built to provide accomodation for elderly married couples. The chapel, built in Gothic Revival style in 1868 was designed by R. M. Phipson. A separate fever ward was built in the 1870s. The other outbuildings around the complex are of 19th century date. The workhouse was known as Union House and Beech House (from the early 20th century). The building ceased to be a workhouse in 1948, when it became an old people's home. In 1975 the building was transferred to NMAS, and the Norfolk Rural Life Museum opened in 1976. See (S2), (S3), (S4) and (S5). S. Spooner (NLA), 13 January 2006. Summer 2004. Re-roofing the eastern wing. Whilst checking bricks reused to restore the roof of the eastern wing of Union House two examples of moulded bricks bearing the name 'Hubbard' who won the tender in 1871 to construct infectious wards, erection of new buildings at the workhouse as well as a number of modifications. S. Howard (HES), 8 March 2011. For details of laundry see (S7). E. Rose (NLA), 22 December 2005. 29 May to 1 June 2007. Excavation. Learning Centre Yard. 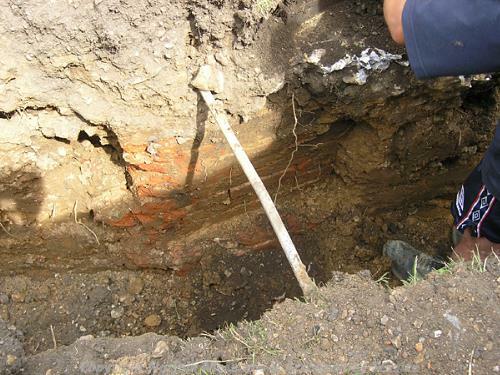 Small-scale excavation in the Learning Centre Yard at Gressenhall Farm and Workhouse exposed a brick wall footing. It is possible that the wall formed part of the yard boundaries that were demolished in the early 20th century. M. Dennis (KLM), 14 December 2007. Proposal to remove an internal non load-bearing wall, relocate stud wall to include a new doorway into kitchen area, remove current flooring, level the sub base and replace floor and to provide an additional doorway and path to the building. H. White (NLA), 22 January 2009. Fragments of gravestones left behind by NAU Archaeology are to be reused in the Museum's herb garden. It is believed that these came from excavations in Norwich (Heather Wallis, for NAU), and a wall behind the Shirehall (possibly NHER 429). D. Gurney (NLA), 26 August 2010. Detailed architectural plans show the uses of each part of the building as Mitford and Launditch House of Industry in 1780 (S10), Mitford and Launditch Union Workhouse in 1872 (S11) and Mitford and Launditch Poor Assistance Institute in 1930 (S12). A. Cattermole (HES), 17 June 2011. 11 February 2013. Cable trench excavated across the south-east corner of the main courtyard, outside the entrance to the Historic Environment Service offices revealed a number of walls, and a deposit of ash and slag immediately outside the door. See digital photos. The wall running across the courtyard was a courtyard dividing wall, and the floor tiles and walls right outside the HES office entrance were related to a steam-jacketed boiler for the infirmary wards (S14). D. Gurney (HES, 14 March 2013. S. Heywood (HES), 30 July 2014. --- Aerial Photograph: TF9717 A-D,H-Z,AG-AN,AQ-AU,AW-ABZ. --- Publication: 20 March 1971, Parson Woodford Diaries. 20 March 1781. --- Newspaper Article: Eastern Daily Press. 1977. Museum Cottage Enlists WI. 27 January. --- Newspaper Article: Dereham and Fakenham Times. 1975. Gressenhall institution finally closes. 7 February. --- Newspaper Article: Eastern Daily Press. 1975. Grim recollections of Norfolk's poor. 8 February. --- Article in Serial: Turner, M.. 1996. Times Past at the House of Industry and the Workhouse.. The Norfolk Plough. Vol 7. --- Newspaper Article: Eastern Daily Press. 1987. Heavy overload for museum floor. 13 June. --- Newspaper Article: Eastern Daily Press. 1996. Photograph of machinery in museum. 16 April. --- Newspaper Article: Eastern Daily Press. 1998. Workhouse was never a prison (letter to the editor). 10 June. --- Newspaper Article: Eastern Daily Press. 1999. Let's plough in all that cash. 31 March. --- Newspaper Article: Eastern Daily Press. 2000. Car park work starts despite protests. 19 May. --- Newspaper Article: The Journal. 1975. Crowds visit Beech House displays. 26 September. --- Newspaper Article: Eastern Daily Press. 2010. Museum bids to cope with extra visitors. 4 August. --- Article in Serial: Lodey, J.. 2004. The Story Behind a Brick.. Rural Life: The Journal of the Friends of Gressenhall. --- Newspaper Article: Eastern Daily Press. 1974. Beech House approved as museum. 15 November. --- Newspaper Article: Eastern Daily Press. 1996. Museum project awaits go-ahead. 18 May. --- Newspaper Article: Eastern Daily Press. 2012. Museum marks milestone. 29 March. --- Newspaper Article: Eastern Daily Press. 2011. New plans for museum. 30 December. --- Newspaper Article: Eastern Daily Press. 2013. Seeds of shop's past grow into exhibition. 22 May. --- Newspaper Article: Eastern Daily Press. 2013. Green fingers are twitching as Radio 4 reveals Norfolk location. 4 June. --- Photograph: BPN 15-18, BYN 9 CLJ 32-6, EGL 30-36, GYT 3-5,HRA 4. --- Newspaper Article: Eastern Daily Press. 2013. Mammoth project to shine light on historic treasures. 21 June. --- Unpublished Report: Pope, S. 2005. Excavation Report Summer 2005 Norfolk Rural Life Museum Gressenhall. <S1> Unpublished Contractor Report: Ashwin, T. 2000. 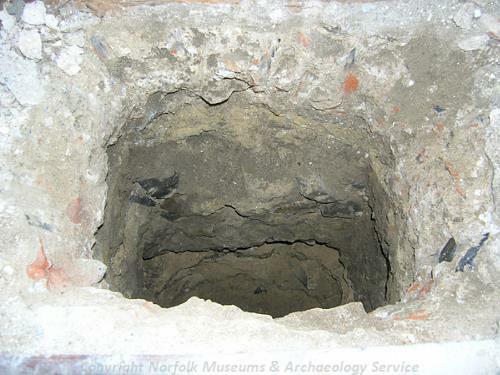 Report on an Archaeological Excavation at the Norfolk Rural Life Museum, Gressenhall, Dereham. Norfolk Archaeological Unit. 535. <S2> Illustration: Kerriman, R.. 1810. Painting of Gressenhall House of Industry. <S3> Unpublished Document: Reid, A.. 1988. Gressenhall Workhouse (Norfolk Museums Service Information Sheet)..
<S4> Unpublished Document: Rose, E. (NLA). 1996. Building Report..
<S5> Digital Archive: Hutcheson, A. 2005. Brick drain seen at TF 97421 16955. <S7> Article in Serial: Pope, S.. 2005. Gressenhall Workhouse Laundry.. NIAS Journal. Vol 7, no 5. pp5-8. <S8> Unpublished Document: Dennis, M. 2007. 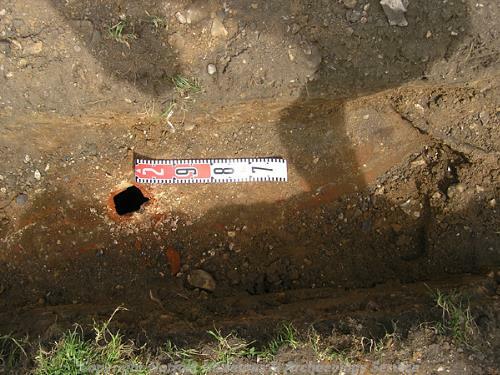 Report on an Archaeological Excavation at Gressenhall Farm and Workhouse, Dereham, Norfolk. <S9> Unpublished Document: 2008. Design and Access Statement for minor alterations to the Café building and associated garden area at Norfolk Rural Life Museum, Gressenhall. <S10> Illustration: Pope, S.. 2004. Mitford and Launditch House of Industry, Gressenhall c.1780. Floor Plans. <S11> Illustration: Pope, S.. 2004. Mitford and Launditch Union Workhouse, Gressenhall c.1872. Floor Plans. <S12> Illustration: Pope, S.. 2004. Mitford and Launditch Poor Assistance Institute, Gressenhall c.1930. Floor Plans. <S13> Article in Serial: Gurney, D. and Penn, K. (eds). 2001. Excavations and Surveys in Norfolk 2000. Norfolk Archaeology. XLIII Pt IV pp 707-728. P 713. <S14> Verbal Communication: Pope, S.. 2013. Gressenhal House of Industry. <S15> Unpublished Document: Heywood, S.(HES). 2014. 'The House of Industry' Gressenhall; A Conservation Plan. <S16> Unpublished Contractor Report: Anderson, S. 2000. Human Skeletal Remains from Union House, Gressenhall. Suffolk County Council Archaeological Service.